Connie Armstrong was born in sunny California. Her father was a marine, so she moved around the country as a child. She mainly grew up in St. Louis, Missouri, and eventually ventured to Indiana State University for college. She knew she had strong creative bones in her body and, therefore, earned a graphic design degree. 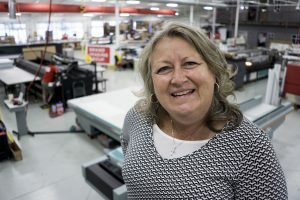 Connie has always dabbled in the print and signage industry. After college graduation, she worked in a graphic design role for a family friend who owned a printing company in Madisonville, Kentucky. It was there where Connie fell in love with the print and signage world, along with her now husband, Steve! Connie and Steve made the move to Nashville in 1995. Upon arrival in Music City, Connie worked at AlphaGraphics in a graphic design capacity, then switched to Dixie Graphics to be in more of a customer service role. When she heard about Big Visual Group, Connie headed our way, and we knew she would be a great asset to our sales team. A day in the life of Connie at Big Visual Group is never the same. She juggles many clients in a variety of industries who need various products. Connie blossoms when she is multitasking and making multiple clients smile. Connie’s favorite thing about Big Visual Group is the company’s customers. She truly believes they are the best in town. She loves serving her customers and putting smiles on their faces! Guess what certification Connie holds? She has had her Master Gardener Certification in Wilson County for over 10 years and loves using her creative juices to help keep her city’s gardens beautiful. Connie’s greatest accomplishment in life is her marriage to Steve. In October of 2017, they will have been married for 32 years! Connie’s other biggest joys are her son, his wife, and their two little girls.